Que. Which city was the capital of Punjab before India got independence? Que. Which is the biggest grain market of Punjab? Que. When was the Punjab and Papsu meged? Que. Who is the Punjabi Poetess to get Jananpith Award? Que. 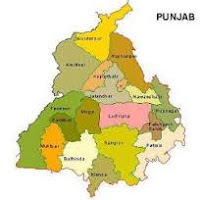 How many divisions of Punjab State? Que. What is the old name of Punjab? Que. Who was the first Chief Minister of Punjab? Que. How many Border State of Punjab? Que. Who is the first IPS lady of Punjab? This page will deals with Punjab Gk MCQ in hindi & Current Affairs GK question answers that means student of Punjab state can get their latest General Knowledge question on their states, villages, cities etc. Read these Punjab General Knowledge Objective Questions and Answers with explanation and Punjab GK & Current Affairs 2016 for State Competitive exams,entrance exams and Job interview. Read many objective multiple choice questions of Punjab -G.K. pdf in Hindi. Practise online thousands of questions related to Punjab G.K.. You can check online answer and try mock tests for Punjab - G.K. Questions provided in Hindi. Jalandhar: There are total 7 districts in this division. The names of these districts are - Jalandhar, Gurdaspur, Pathankot, Amritsar, Tarn Taran, Kapurthala and Hoshiarpur. The total population of districts under Jalandhar division is 10503989 (1.05 Crore). Patiala: There are 5 districts under this division. Ludhiana, the largest district of Punjab is also in Patiala division. The other districts are - Patiala, Sangrur, Barnala, Fatehgarh Sahib and Ludhiana. The population of Patiala division is 8245284 (82.45 Lakh). Firozpur: Firozur division has 4 districts. These districts are - Firozpur, Moga, Shri Muktsar Sahib and Fazilka. All these four districts were once the tehsils of the Firzpur district. The collective population of districts in Firozpur division is 3802313 (38.02 lakh). Faridkot: Faridkot has 3 districts under it and names of these districts are Faridkot, Bathinda and Mansa. Total population of the districts of Faridkot division is 2775784 (27.75 lakh). Note that the population of this division is less than the population of Ludhiana district. Ropar: The Ropar (or Rupnagar) division has 3 districts in it - Ropar (Rupnagar), Ajitgarh (Mohali) and Shaheed Bhagat Singh Nagar (Nawan Shahr). According to population, this is the smallest division of Punjab and the collective population of all districts under Ropar division is 2291565 (22.91 lakh). Thanks Bro.... You are right and i am correcting it. Thanks again for detail information. Name of 6 states ? Its 4. And one international boundary with Pakistan.